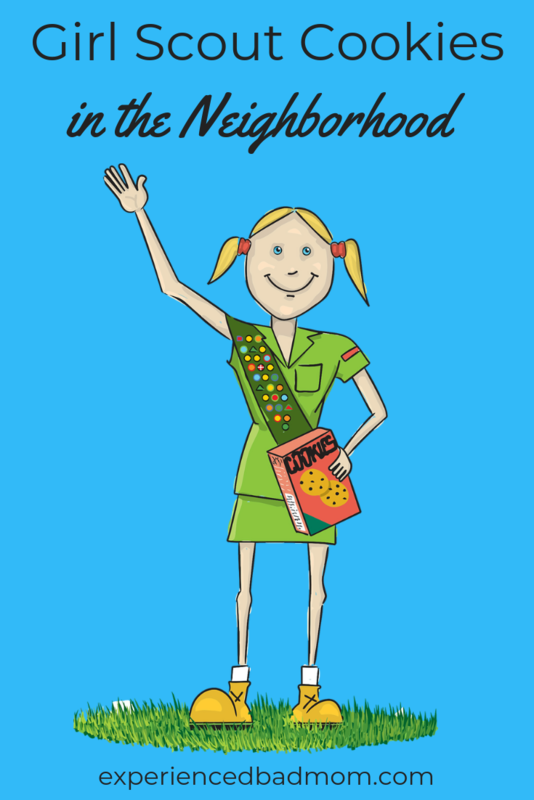 My daughter, 12, has been a Girl Scout since she was in the second grade. She’s a pro at selling Girl Scout cookies by now. However, this year her troop set a lofty goal: each Scout should sell 90 boxes. I think in the past the most she sold was 60-70, and that was with the generous help of one of my coworkers who buys 20 boxes each year for her extended family. So my daughter set out further than ever before in our neighborhood to reach her goal and sell those Girl Scout cookies. And I went with her for safety. Turns out I also went with her for entertainment, as selling girl scout cookies in my neighborhood is a hoot. Barely 10 houses away from home, my daughter rang a doorbell and waited. Nobody seemed to be home. But then she and I heard a loud, distinctive “click”. Yup, our neighbor had just turned the deadbolt on his door to keep us from invading his home, er, selling him Girl Scout cookies. No, he never answered the door. At not one, but TWO separate homes, my daughter was greeted by the man of the house. Who then proceeded to tell her that his wife buys the cookies, he doesn’t know what she buys, and could you come back later when his wife is home? I don’t mean to be judgmental, but shouldn’t a man be able to get $5 out of his wallet and buy some Thin Mints without his significant other’s oversight? “Do you live in this neighborhood?” was the first thing one neighbor said, forcefully, when my child asked if she would like to buy Girl Scout cookies. But what if she didn’t? What if she was some entrepreneurial twelve-year-old from a different neighborhood out hustling to reach her goal? Who cares? Do you want some Doh-si-dos or not? She bought a box. Maybe because we live in the neighborhood. Finally, a shout out to everyone in the neighborhood who did buy Girl Scout cookies. There were even people who bought a box or two even if they already bought from a niece or family friend. To all you customers, thanks! Oooh, I’d love to know the reasoning behind the “Do you live in this neighborhood” query. I honestly wouldn’t even think to ask that. I can remember schlepping boxes house to house back in the day. Up here we call them “Girl Guide cookies.” We sold ’em for $2.50 a box and most everyone would buy at least one. That was when there was only one flavor option and before they changed the recipe. Fast forward a few years to my sister becoming a girl guide leader and keeper of the cookie cartons. She stored them in her garage. Not smart. They all took on a gassy/oily flavor … Yum. Rest assured I’d buy a box or six from your entrepreneur. Any chance you’ll move back? Kelly L Mckenzie recently posted…Time For A New Perspective? Our troop leader is from Ontario and has told us about the one option cookie in Canada. She, too, swears the recipe has changed and raves about the flavor in the old days. I would NOT want to be “Cookie Mom” as the role is described here. Big thanks to the intrepid mom who volunteers to do that from our troop! Finally, if I stored them in my garage they would be frozen. But when they thawed in May, they might still taste good. Oh gosh I remember this. We have done GS with all of my girls, but not my littlest yet. Maybe soon we will back at it selling cookies! Good luck! My family, while living in WA state, was once asked if we lived in the neighborhood while trick-or-treating. I’m not going to lie, I felt totally insulted. It IS insulting! Who cares? !